I remember choral festivals from my own young singer life. Receiving the manilla folder with new music..special because I was one of only a few other singers in my school choir to get it. I could hardly wait to dig in and ﬁnd out what pieces I would be learning alone to bring together in a few short weeks with other talented and focused singers to create beautiful music. fact that they learned it quickly, in small groups, and for one song, in a language that was not familiar to any of them. A huge highlight for me was the fact that one of my daughters had jumped in at rehearsals and learned all the music and I got to see her up there singing, dancing and clapping and just full of joy. 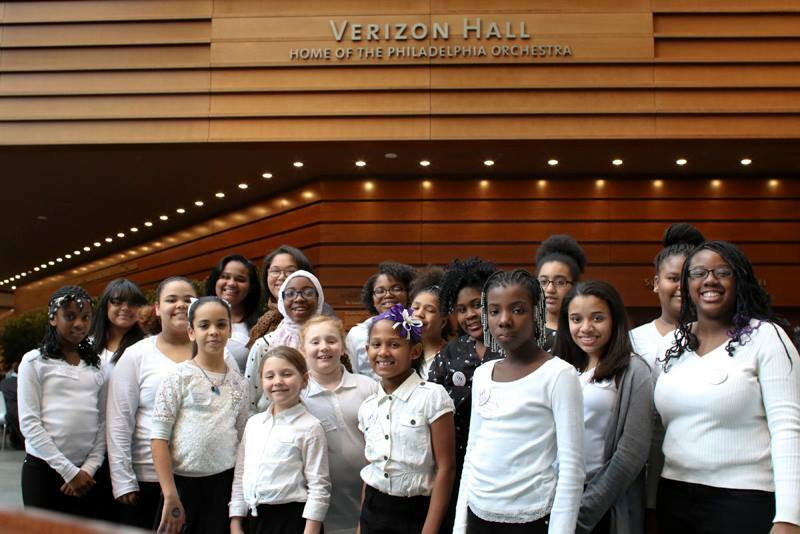 At rehearsals we teachers had been stressing to the girls what a unique experience this was; not just for the fact that they would be coming together with 160 singers to make beautiful music but that because of the generous donation of the Philadelphia Orchestra they would be doing it on the stage of Verizon Hall. Many professional musicians aspire to the level of accomplishment where they might be invited to perform there! One of our goals at SCG is to foster the building of community amongst the girls, and not just in the smaller groups we meet with at our individual sites, but as a whole. Throughout the day girls from different rehearsal sites would approach us and ask when they were going to see each other again, hanging on each other and hugging and giggling as young middle school girls are apt to do. It showed us that not only was the bigger event a huge success but also that for our Sister Cities girls, they had an experience of belonging with each other; and that’s irreplaceable! Festival days are long, and not only require musical focus and hard work, but physical focus as well. Rehearsals that lasted 2 or more hours with very little time to stretch or take breaks were challenging for all of the singers. I am so proud of how each of the girls showed up and brought their absolute best to the day. The results were an experience that all of us will always remember! Next SCG at the Phillies!